The Parti Québécois was founded in 1968. It was a separatist party which planned, once elected, to proclaim Quebec independent from the rest of Canada. 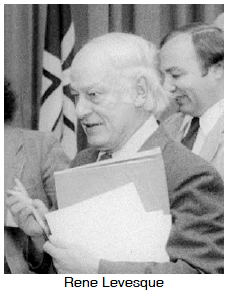 Its first leader was René Lévesque, a former journalist and cabinet minister in the Liberal government of Jean Lesage. The PQ (or "péquistes") didn't do very well in their first two elections and decided to tone down their separatist policies by promising a referendum: when a matter is submitted to a direct vote of the citizens for approval or rejection.referendum on the issue before taking Quebec out of confederation. They won the election of 1976 and one of their first acts was to pass Bill 101 which confirmed French as the only official language of the province. It was to be the only language of government and business, and all children except for English-speaking Quebeckers, had to go to French schools. This meant that any new immigrants to Quebec had to adopt the French language. The PQ kept its promise of a referendum and in 1980 the people were asked the question: Did they want separation or not? There were vigorous "Yes" and "No" campaigns and the outcome was a majority "No" vote. But during the campaign against separation, Trudeau had promised constitutional changes for Quebec which the province now wanted him to deliver. The fact that the constitution was patriated without the changes Quebec wanted was seen as a serious betrayal by Quebeckers.